This comforting, gluten-free broth is packed with fresh vegetables, while the miso paste brings great depth of flavour. Making your own bone broth adds extra goodness. This meal provides 458 kcal, 20g protein, 72.5g carbohydrate (of which 8.5g sugars), 10g fat (of which 0.8g saturates), 9g fibre and 3g salt per portion. Put all of the ingredients for the bone broth in a large lidded pot and cover with cold water. The water level should cover the bones by 5cm/2in while still leaving room at the top of the pan. Cover and bring to the boil. Reduce the heat and simmer for at least 6 hours for chicken and 12 for beef or lamb, skimming off any foam that rises to the top. Strain the liquid and return to the pot, set aside. Cook the buckwheat noodles according to the packet instructions, using plenty of water. During the first minute of cooking, use two forks to stir and separate the noodles. Drain the cooked noodles and rinse under cold running water for 15-20 seconds to stop them cooking any further. Set aside to drain, then drizzle over a little sesame oil and mix through to prevent the noodles from sticking to each other. 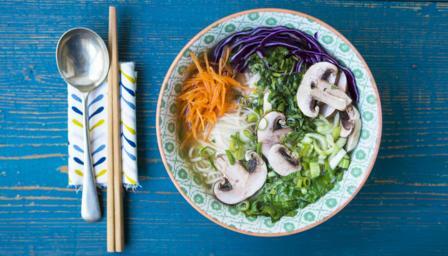 Divide the pak choy, mushrooms, carrot and red cabbage equally among four serving bowls. Gently heat the bone broth and stir in the grated ginger, spring onions, lime juice, miso paste and tamari. Pour the hot broth over the vegetables, sprinkle the coriander on top and serve.